Fried food is the last thing I need to eat, but I needed to eat at a seafood restaurant at the South Street Seaport just to give them my business. 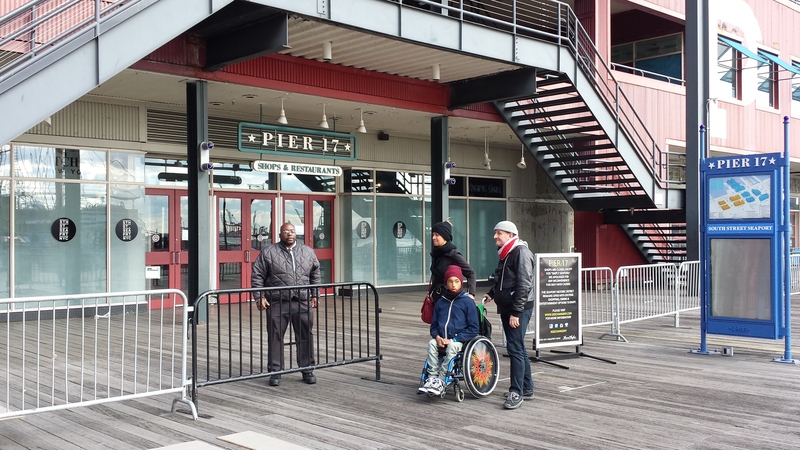 As I approached the Pier 17 mall, I found it surrounded by barricades with the only entrance guarded by a security guard turning people away. He admits that the restaurant is open, but calls it a “café” when it clearly is not. “I understand there’s one restaurant still open inside,” I said to the guard, who was discouraging someone from entering. 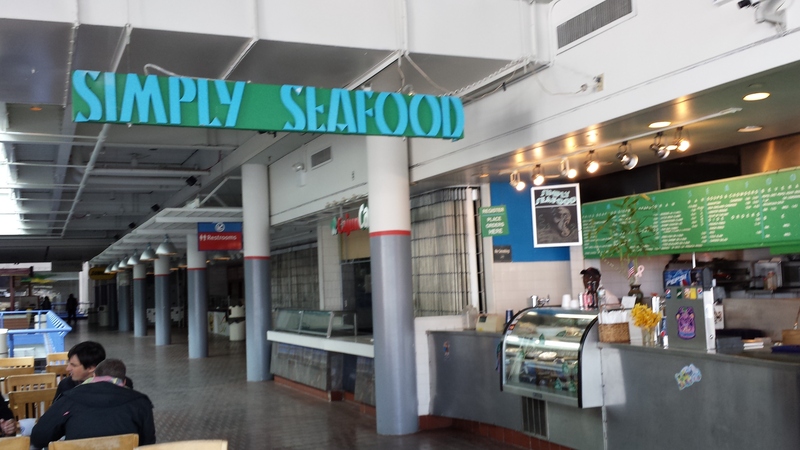 The restaurant that remains open among dozens of empty storefronts is called ‘Simply Seafood’ and it’s clearly a restaurant like any other food court restaurant in any food court, only this one is the only business left in a large three-level mall at the South Street Seaport. The restaurant is the lone holdout in a large mall that a developer is trying to tear down. They have a lease and expect it to be honored. The landlord has used illegal and very underhanded tactics to try to remove them, such as locking the doors to the mall and reporting that the restaurant had closed, and is still using dirty tricks today. With shady developers normally getting away with their violations of private property rights in the name of economic development and the city normally either turning a blind eye or helping out in with corrupt deals, the urge to score one for the little guy is immense and well worth the price of fried shrimp. Howard Hughes Corp. owns the property and wants to build another, fancier mall there. I would hope that if Howard Hughes were alive today he’d throw a jar of his collected urine at the people running this namesake corporation. Howard Hughes didn’t need to harass small business owners; he flew airplanes and banged Katherine Hepburn. Security guards pace the otherwise empty mall eyeing customers suspiciously. 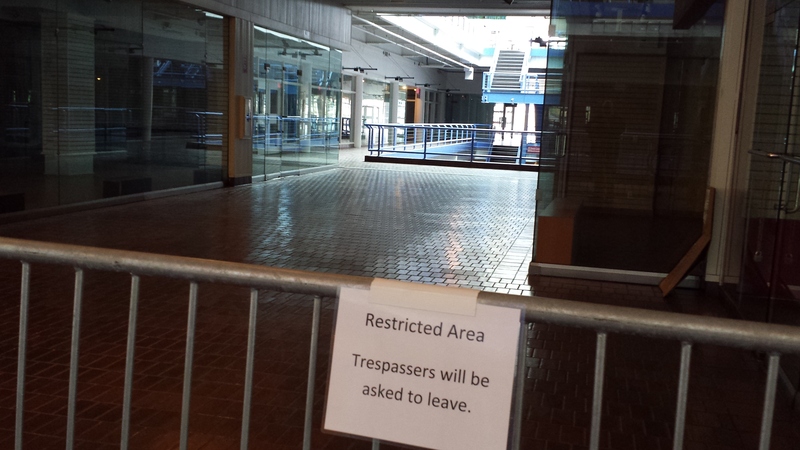 There are bathrooms open on the second floor, but otherwise the mall is a ghost town of abandoned stores, makeshift barricades, ‘No Trespassing’ signs and caution tape. Despite the best efforts of the rent-a-cops, people continued to come for seafood. The restaurant’s struggle with the landlord generated publicity that has brought some people; it’s why I was there. The allure of touring a mostly-abandoned place brings more, and hopefully the chance to stick it to a real estate Goliath will bring more. New Yorkers can’t help but respect and admire the people who fight for their rights even against overwhelming force. New York landlords are notorious for their unscrupulous behavior. The price of real estate is so high and both the expenses and potential profits so huge, a hold-out tenant can cost an owner lots of money. 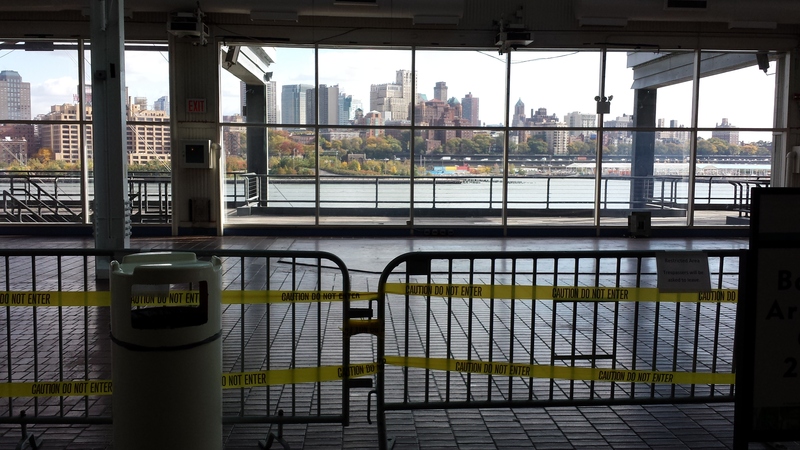 In the case of a prime commercial real estate in New York’s tourist-heavy downtown, developers stand to lose millions of dollars if they have to maintain a mostly abandoned building for the next seven years. A small group of tourists asked the men working why they were the only business still open at the mall. I had a lunch of friend shrimp and fries. What made it such a delicious meal was helping a determined small business stick to their guns. As I left the mall, the security guard at the entrance was turning away another group of potential customers, wrongly calling the restaurant a café. But not everyone was turned away, many continued through and moved on to give the restaurant their business, and I hope Simply Seafood is there for a very long time. the truth is they are just gonna wait til the landlord buys them out. I think its great that the obnoxious developer is losing a lot of money out of greed, but ultimately the little guy just wants a piece, and had the brains to stick out their lease.